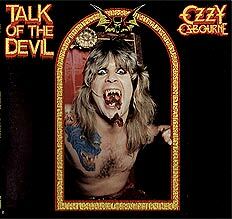 This album known as “Talk of the Devil” outside of the US, as that is the proper idiom of “Speak of the Devil” there. The album of “Sabbath covers” was Ozzy’s idea, as he was contractually obligated to deliver this, and he didn’t want Randy’s name & work on an album called “Speak of the Devil”. Sweet Leaf does not appear on all versions. Some of the earliest prints of the album omitted this song due to “compact disc programming limitations”. Recorded live at the Ritz, New York, New York on September 26 & 27, 1982. The band had only a couple of days to rehearse and learn all these songs (it shows in places). In April 2002, this album was deleted from the Ozzy catalog and is no longer being made, except for some prints in Japan. This is the only official Ozzy Osbourne album that Brad Gillis appears on. 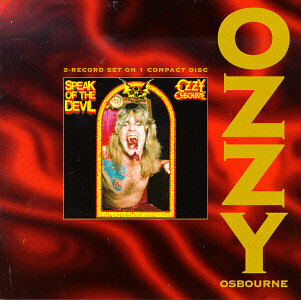 When the album was released in 1995, it gained the “small cover art, giant Ozzy” motif. That cover can be seen below. The Talk of the Devil cover and the Speak of the Devil cover are extremely similar – in fact the only difference appears to be the difference in word between “Talk” & “Speak”. Great album, as it contains a couple of, as then unavailable live tracks: NSD,SBS, Wizard live versions were almost non existent in the 80s. thank god for Youtube. Terrible album in terms of sound! Under rehearsed, the band sound like session musicians who neither understand or like the music. This album (along with We Sold Our Soul) was my introduction to Black Sabbath. Speak of the Devil provides a nice cross-section of Sabbath’s Ozzy albums (except for Technical Ex). It was fun to compare the original versions to the ones on here. I have this on double album vinyl. I really like this album. OK its not TI or GB but I really like the powerful drumming of Tommy Aldridge and the wild whammy bar guitar leads of Brad Gillis! 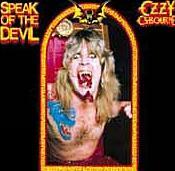 This album sort of introduced me to Ozzy, alongside Live Evil which showed me the other side of the coin so to speak. Good renditions of Sabbath classics and Ozzy sounds hyper (though I do think studio trickery was used to enhance the vocals). The album art is done by Steve Krusher Joule also, at the same time he was creating Sabs Born Again lp, notice the similarities in the text/font. A very heavy album though production wise it is quite weak, a nastier bass and guitar tone would have pumped it up greatly. After listening to the board tapes from the 2 shows listed, it sounds like the bulk of it was taken from the 2nd night. Most of Ozzy’s vocals are overdubbed but just about all of the in between banter sans the cursing is from the actual show. Shockingly most of Ozzy’s original “live” vocals don’t sound too bad except Symptom & Never Say Die. Also Sabbath Bloody Sabbath was recorded at soundcheck.